700 followers giveaway - closed. I've been on the edge of my seat for the past month slowly watching my followers creep closer and closer to 700... it's been so exciting as I never ever (ever) imagined that I could have so many dedicated, kind and amazing readers of my little blog. I am so incredibly glad and excited that you are all here and sticking around!!! So to celebrate (I love a good celebration) I'm kicking off this week with a giveaway from one of my favourite shops and one of my favourite creative ladies! 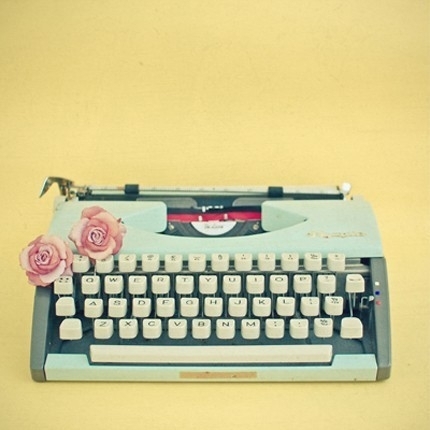 And today, you can win: A 8x8 print of The Typewriter from Lola's Room. How to enter: Visit Lola's Room and leave a comment with your favourite item. p.s. 700 is pretty epic right, keep your eye out for a couple more celebrations this week!